We have had quite a whirlwind of activity this spring, and I can’t believe it’s already Memorial Day Weekend! We have a bunch of work planned in the house this summer, some of which is already completed or in progress. I will hopefully get around to writing detailed posts on each of these projects, but in the meantime I figured I could provide a high-level summary of what we are working on! When we bought our house, I noticed during the inspection that there was a dip in the floor in the bedroom on the left side upstairs. I went back down and took a look at the ceiling in the living room, which was directly below, and it was also noticeably not level. 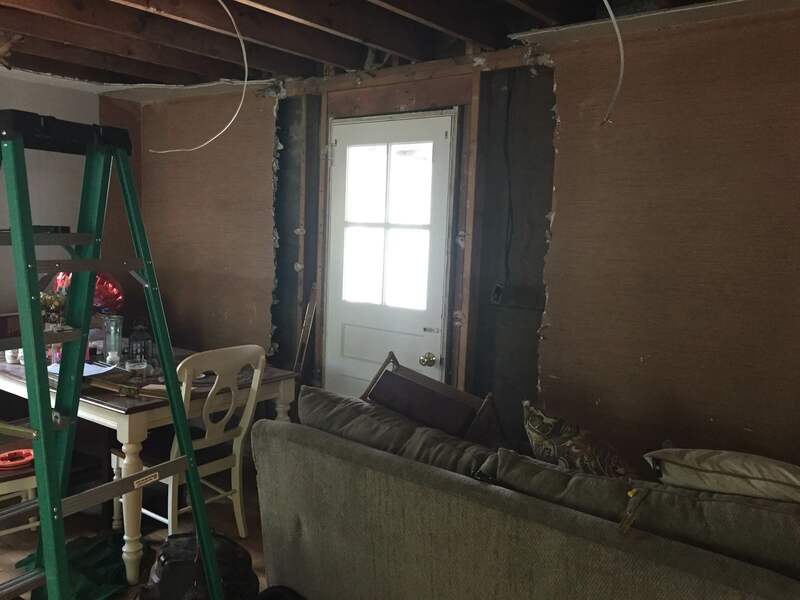 It seemed like someone had removed a load bearing wall at some point and not resupported to account the load that the wall carried. While we were assured it wasn’t anything to be alarmed about, we worked with our realtor and a friend of the family who is a contractor to get an estimate for the work required to rectify the issue, which would entail opening up the ceiling and sistering stronger support components to the existing structure. We were able to negotiate a credit at closing to cover the costs. We finally got around to getting it done ~1.5 years later. This is actually one item we can check off our list!! Big thanks to Dave Breuder at Breuder Home Improvements for giving us peace of mind!!! Since we already had to open up the ceiling, we wanted to take the opportunity to install recessed lighting. The only places in our house that currently have any overhead lighting are our kitchen, bathrooms and hallways. Our bedrooms, living/dining space and office are so dark and it’s a major problem- to the point where we end up moving lamps from other parts of the house when we are entertaining. Sometimes it’s the little things that you may not notice off-the-bat when you’re house hunting that will end up really driving you nuts down the line!!! Because we use the living room as a living/dining combination, we are putting a fixture over our table as well, instead of recessed lighting throughout. This is in progress, and Mike, aka Super-Husband, has done all of the wiring and installation himself. Jack-of-all trades much?! Again, taking advantage of the disarray that would be inevitable giving the structural work happening in our living space, we decided to bite the bullet and begin a project that we really went back and forth on. 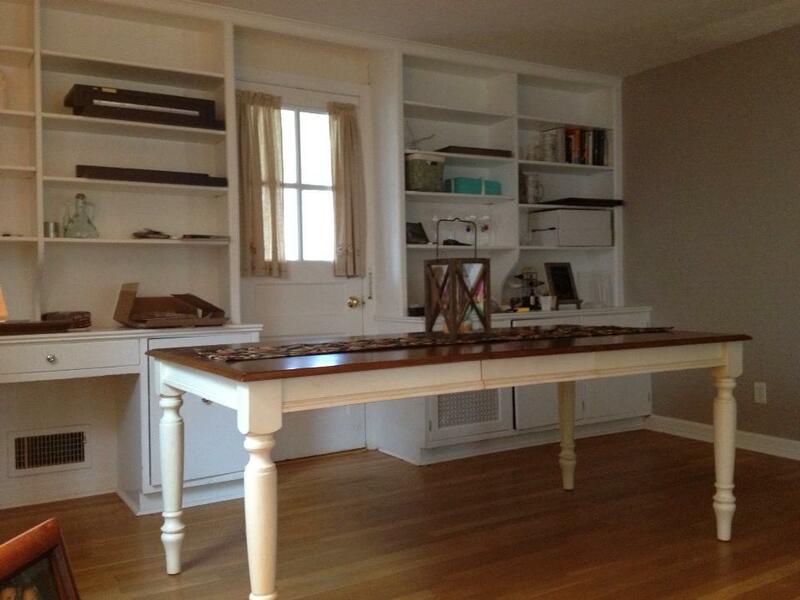 Along the rear wall of the space, there is a door to a sun room/porch, with built-ins surrounding on either side. I LOVE built-in shelves for their character and function in general, especially in older homes, but our built-ins really weren’t especially nice. Additionally, because we use the room as a dual-use space, eating up ~26 square feet of floor space with built-ins that were 24+ inches deep wasn’t optimal. Lastly, the door that was currently there wasn’t a proper exterior door, was super drafty, and also didn’t allow for very much natural light in the space. We really loved the idea of adding french doors for an up-scale, classic impact. 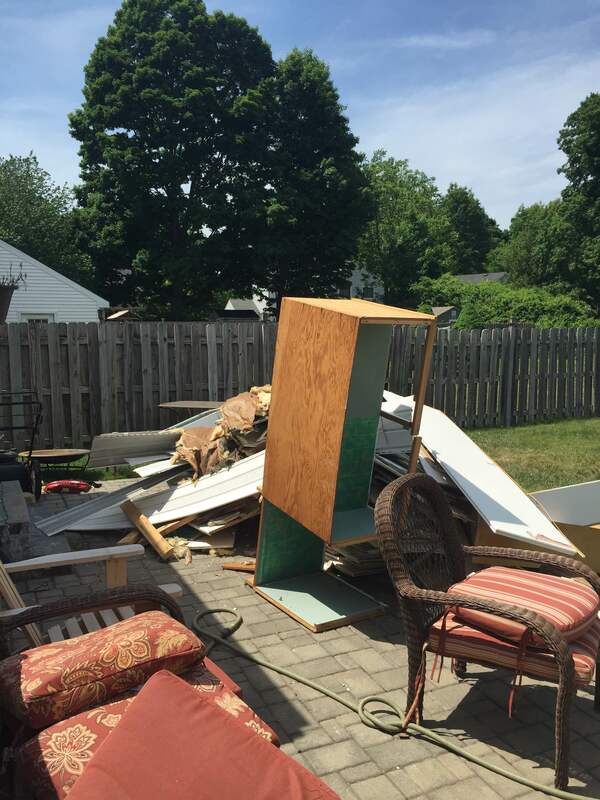 Thus, our brainstorming resulted in demolishing the built-ins and making room for 5′ of french doors. We picked up the doors yesterday and hope to get the framing done sometime in the next two weeks. This is another area where Dave Breuder will be helping us out. We love to DIY but when it comes to structural type stuff, we think it’s much smarter to consult a professional! We had been considering this for awhile, but removing the built-ins has given us the kick in the pants we need to bite the bullet and do it. We needed to do it sooner than later regardless, but we definitely need to sand the area that used to be under the built ins to be level with the rest of the floors immediately. We also have a few unfinished steps at the bottom of our stairwell and have not yet succeeded in finding a matching stain to the rest of the stairs or floors. We are concerned with logistics of the floors, because 1. our house is not an easy place to relocate furniture within and 2. we have active dogs that we are worried will ruin them immediately. We are leaning toward hiring professionals for the floors because of these reasons, and also because I’ve read that even the savviest DIY-ers can have trouble when refinishing floors. If you ask Mike, this is on our “definitely” list, but I think we will have to see how the rest of the summer plays out. 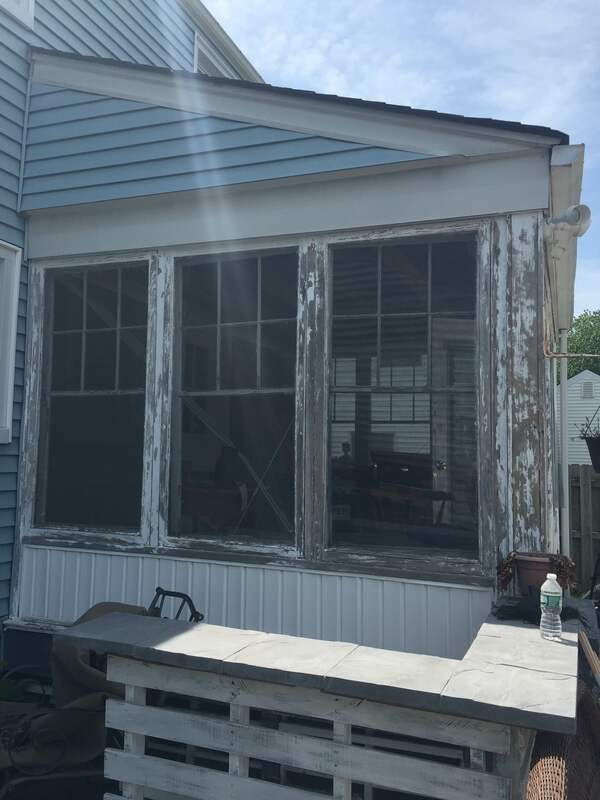 The porch off the dining area, which we call “The Shanty Porch”, does desperately need to be repaired, and adding a deck next to it would really bring more continuity to our outdoor space and access to our kitchen. We currently have a paver patio off the kitchen and next to the porch, but the two spaces are very disjointed. I’m still not convinced we shouldn’t add living space on to the back of the house so I’m hesitating to pull the trigger. 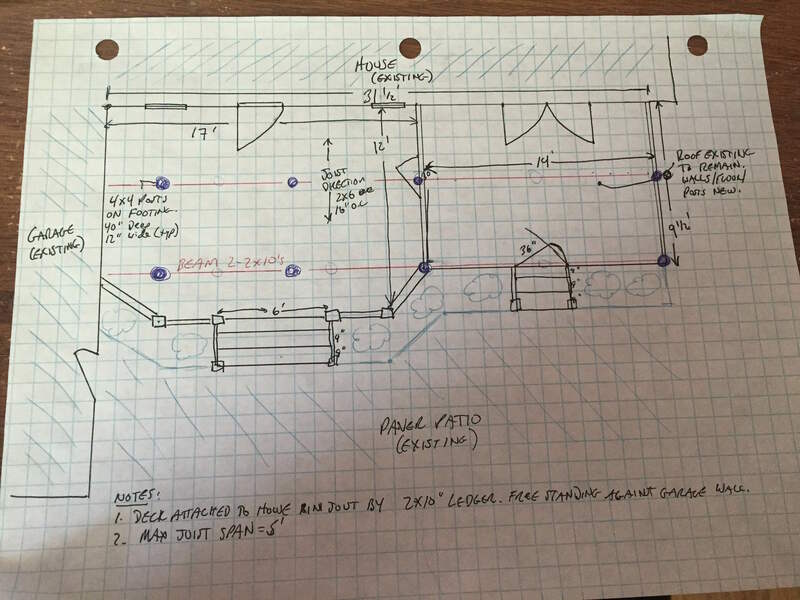 The plans that Mike drew up are looking pretty epic though, so maybe we should just go for it! My kitchen is my least favorite part of our house. It’s small, closed off from the rest of the house, has no room for seating and consequently has become the bane of my existence. If we were to open it up to the bedroom that’s next to it, we would be able to pull off a more open-concept kitchen/dining space. However, bringing the house down to two bedrooms is not smart for resale value (hence my hesitation to take adding on off the table that I mentioned above.) However, we found a designer kitchen online that served as inspiration and made us feel like we could actually make our kitchen work better without changing the footprint. 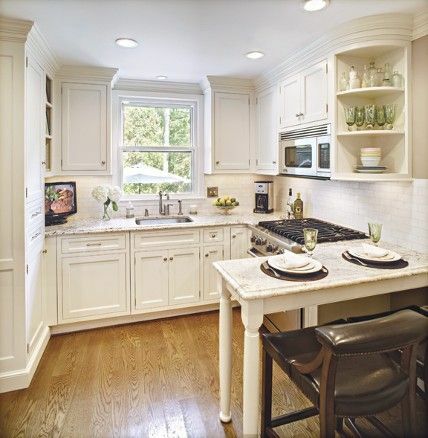 We started looking into replacement countertops, floors and backsplashes, and things were really looking up! However, once I stopped focusing on how much I hate my countertops and the fact that there is no seating in our kitchen because solutions were on the horizon, I realized how much I truly hate my cabinets. They are white, and at first glance, not offensive- but they are cheap, poorly laid out and now I can’t stand the thought of spending money to put beautiful countertops on top of them. So, we are putting off decisions in that area for the time being. Basically, we need to decide how much we are willing to invest in the kitchen in it’s current footprint, because even with improvements in functionality and aesthetics, it will still be far from an ideal kitchen. I think that’s all that we have for now. I’ll throw in a picture of what our yard looks like currently for good measure, since Mike doesn’t want to get a dumpster until we demo the porch. Is anyone else taking on Summertime renovations? Am I the only one whose home is a swirling vortex of entropy? What kind of projects are you taking on this Summer? Have you ever had to make tough design choices? What are the things you didn’t think about when you were house-hunting but completely and totally drive you nuts now that you are in your home?